I stopped in at the Cowichan Exhibition grounds yesterday. Mostly just to snoop, and to let my kids get a feel for the place before the crowds roll in tomorrow. We passed the amusement rides on the way in. “Look Mom! A merri-go-round!” says a kid from the back of the van. I think she was referring to the Ferris wheel. I hope she wasn’t referring to the Zipper. Needless to say, the whole family is looking forward to this weekend. Last-minute painting and sign placement is underway to get the new location ready for its inaugural show. The barns await competition livestock, and tents are set up for food and product sales. In Mellor Hall, white tables are labelled with competition event names, like Honey, Garden Produce, and Junior Hobbies (can’t wait to see what the 5-year-olds enter). In all the anticipation, what impressed me most is the mural on your left as you enter Mellor Hall. 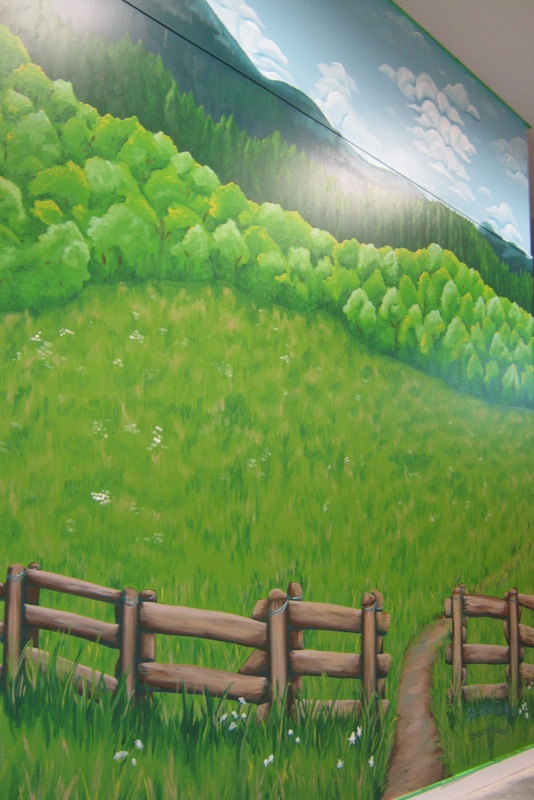 Floor to ceiling, it’s a gorgeous painting of Mount Prevost and what I think is a Garry Oak preserve in the foreground. It must have been a challenge for artist Jennifer Tinsley to keep perspective with such a large mural in a narrow passageway. Talented lady. A tree (not shown in this image) sculpted by Torban Madsen is the mural’s centerpiece. Golden leaves with the names of all the exhibition sponsors adorn the branches. Makes me wish I’d sponsored the thing! See you at the CowEx (I’m so local). Back in the good old days! Given the amount of cars parked out there today, I’m sure it’s way too big to be in Maple Bay now. I can’t believe how busy it was — imagine what tomorrow will be like if the weather holds! Jen Tinsley is amazing. And, she is also a very very nice lady. With 3 kids too!